This article describes step-by-step the process of conceiving a “universal” medical consultation scheduling tool. The objective of this work was to define a long term vision and a framework to future developments related to scheduling. Our company was planning to merge two properties providing primary care and behavioral therapy, so we needed to envision an appointment scheduling tool which could comply with a large array of scheduling practices. We launched an inquiry to understand more in depth the range of scheduling needs of different kinds of care supported by our platform. We also looked at patients’ expectations and practices regarding scheduling a visit. Our ultimate objective was to synthesize a live appointment planning transaction so it could be automatized. 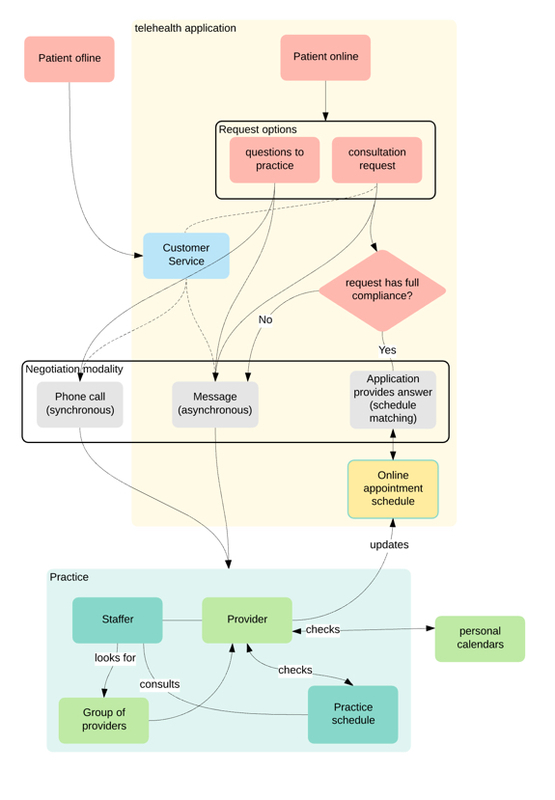 We listed the components of scheduling transactions and created a blueprint for appointment transactions. With this document, and the user research done beforehand, we could establish a list of “experience requirements” to define potential features. We needed to find ways to reduce the number of transactions necessary to negotiate an appointment time and found that we should focus solely on the available time, starting with asking patients to declare availability and then match the request to the provider’s declared availability. Then we proceeded to define layers of automation based on user compliance with our schedule tool. The variations in compliance--for instance, providers may or may not sync their personal calendar with the application--and our own development resources over time made us conceive an array of complementary features, all of which we could rate in terms of importance and development difficulty. A PRIMARY CARE PLATFORM: The “mothership”: this is an online primary care clinic where patients queue up for phone or video primary care consultations. A nationwide network of providers come online to the site to pick up online consultations. The workflows developed for this application support an “urgent care clinic” operated via a call center. Patients check in by calling or connecting online and are picked up by the first available provider. A significant number of visits occur solely through phone transactions; fewer patients use the service online. A BEHAVIORAL THERAPY PLATFORM: The other property is a behavioral therapy market place where patients come to choose therapists for a series of online video sessions. Therapists use the service to expand their practice to an online client base and provide their existing patients with an online video consultation option. The workflows were initially developed to support a market place for a single provider practice. All the transactions occur online. Our leadership decided to consolidate our services and integrate our behavioral service to the primary care platform. During the initial high-level discussions I explained how a primary care experience was different than a behavioral experience, and that integrating the two would require drastic workflow changes. I concluded that this project was our opportunity to transform our virtual primary care clinic into a virtual medical center. By appropriately planning this work we would eventually cater to any medical specialty. I obtained a short window to explore the impact of the integration on our users’ experience. We were 3 user experience designers and an associated product manager working part time on this project. We would meet at least twice a week to discuss discoveries and plan for the next segments of work. Each meeting was an opportunity to share knowledge and challenge new concepts. Alternatively we would meet with the project manager to share milestones and broadcast our work to the project team at large. 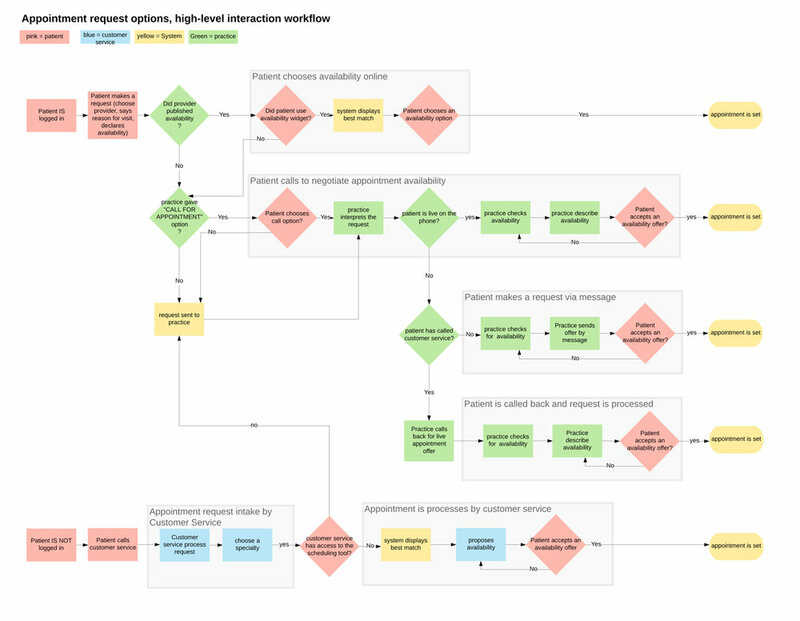 During an early meeting with members of the UX team and product managers we agreed we would split the work into 2 sections: what happens before a consultation - what happens after a consultation. This case study focuses on the “before” and specifically on scheduling an appointment. We listed some assumptions about the differences between a primary care service and specialty care (including behavioral): the primary assumption was that people choose and request appointments with specialist. We highlighted a number of workflow and usability issues we had discovered during previous projects. The applications were developed before the company had a UX team, so there was no documentation of the pages or the workflows. Consequently, all participants of a project—stakeholders, product managers, engineers and subject experts would make assumptions based on their own individual experience. Competitor’s website's functionality are often mentioned, but without documentation we wouldn’t be able to appreciate the relevance of the reference made. So I encouraged every collaborator systematically document their findings. A shared collection of documents help establishing a collective understanding of the environment of a project. 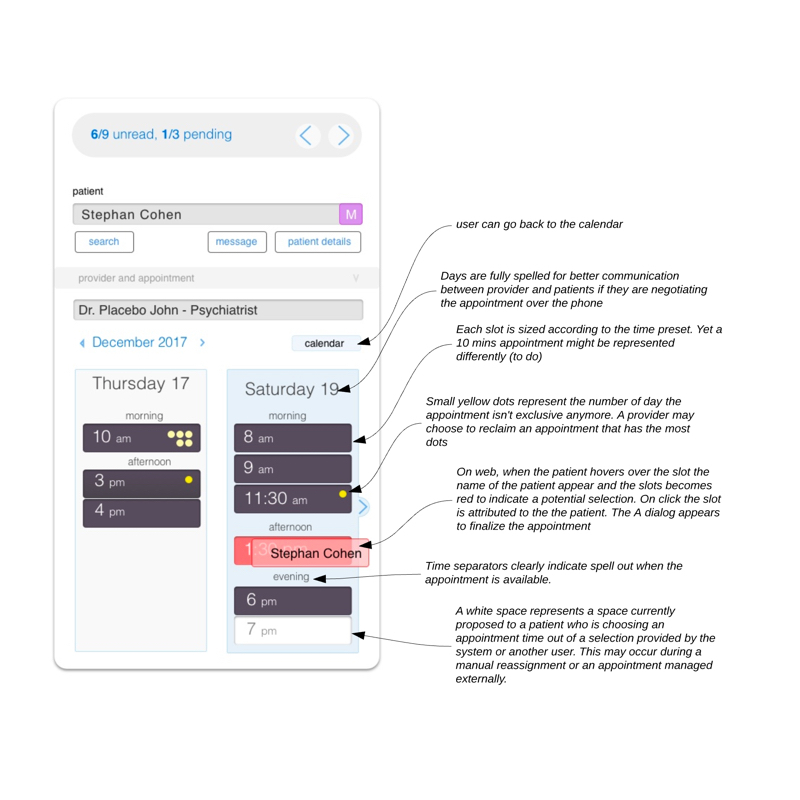 Documentation was a multi-fold effort: a study of the competitor’s workflows, a gap analysis based on a comparative observation of similar features to reveal differences and incompatibilities, and a collection of references from other systems. We would collect screenshots, video screenshots if the interaction observed was relevant, and build high-level interaction workflows. We were working within an existing environment with two functioning platforms and we needed to compare them to see if the medical platform had equivalent features, workflows and components to see if anything was salvageable. We - the UX team - focused on workflow differences and user experience requirements while a product manager focused on technicalities such as comparing data schemas and what is necessary to define a user, and documenting the processes triggering records or notifications. We found a significant gap in the consultation request process for our medical application: patients were left with the impression that they could contact any doctor they liked. If a provider didn’t plan her online presence and no appointment hours were available in the near future, a dialog window would let the patient send a message to the doctor. That message was actually sent to customer service in an exception queue. Then customer services would act as an appointment broker and contact both parties to negotiate then set the appointment. The workflow wasn’t enforced and, needless to say, patients would never hear back about their consultation request. We explored the administrator tool and studied how an appointment was created. The patient who makes a request is manually added to a doctor’s queue; by doing so, a notification is sent with the appointment’s details via the antiquated internal message system which was heavily criticized by providers for being cluttered by notifications. Consequently providers would miss appointments, and patients would call to complain to customer service and only then get connected to a provider who was online at that time. Most providers would react to notifications sent by email more than by systematically logging in. Email notifications prompt the provider to log in, then to check their appointment list and identify the requests. Providers would consult their personal calendar to define their availability. Providers would answer requests with up to two appointment proposals. They would message patients through the platform to address issues or questions. Some may send a personalized message to engage the potential client. Newly confirmed appointments would show in a specific column. Providers would take notes and edit their personal calendars. None of the providers we talked would use the application calendar because it didn’t reflect the entries in their primary calendar. Define appointment frequency and appointment offer expiration date. Define a number of appointments planned. Each appointment generates a” ticket”. The patient chooses a first appointment. If more appointment tickets are emitted the patient will have the opportunity to choose for the following appointments within the parameters initially set by staff. We looked at other telehealth application workflow and focus on those who had a psychiatry network. There was no opportunities to find based on earliest availability. 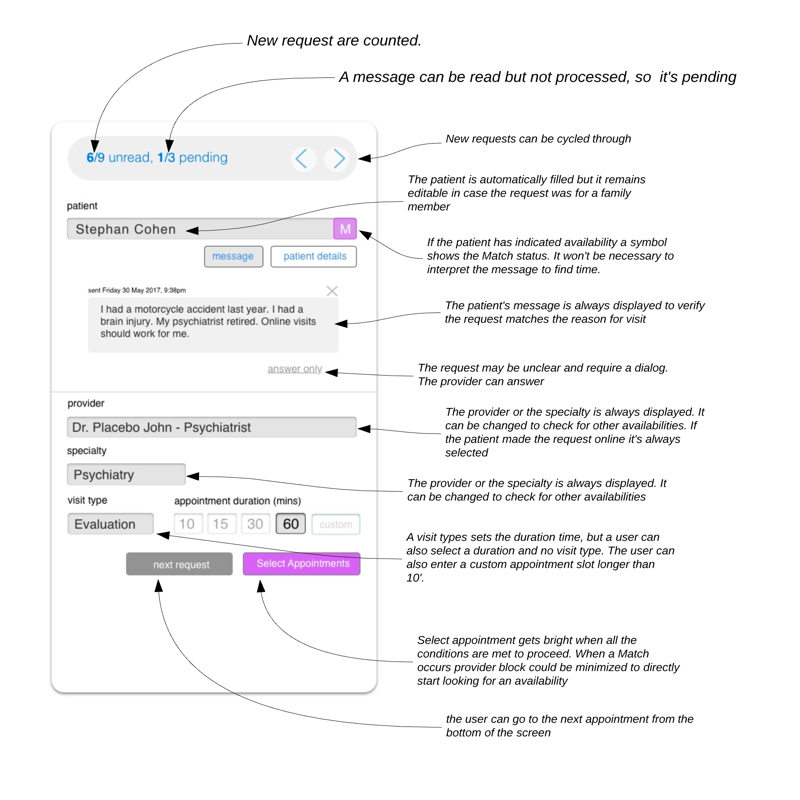 Now that we’d built a visual documentation of what existed we still needed to check how our users would proceed to request appointments or answer an appointment request. We organized conversations with several types of providers: medical doctors and behavioral therapists. We also talked to subject experts among our vertical product managers (medical providers, psychiatry, health systems, behavioral). We asked behavioral providers how they were using the behavioral platform for scheduling. We asked every provider we talk to to describe real world appointment management and scheduling. Providers generally use a staffer to handle their appointments. When providers are handling their own scheduling they want to avoid live interactions as they are too time-consuming. Communicating by messaging prior the appointment is less time consuming than taking calls. All providers will refer to a “primary calendar” which is either their EMR calendar or, oftentimes, a consolidated calendar organized on their own devices (e.g. importing Google Cal, iCal formats). There are differences between providers operating from a clinic with fixed work hours who tend to allocate “online hours” and providers operating on their own and considering personal calendars when planning consultations. Appointments are always negotiated between parties unless the provider’s schedule is published online and visible to patients. This is usually done quickly on the phone. It can be done over emails (asynchronous messaging) but can lead to several rounds of back and forth communications. Consultations can be of different lengths and the nature of the consultation involves a range of fees tied to the procedure performed. Providers want to spend the least amount of time managing appointments. Few providers, especially specialists, are invested in telehealth but are willing to give it a try. Most medical providers delegate appointment management to a staffer. Telehealth consultations account for smaller portions of a provider’s workload. Consequently, they tend to refer to a primary calendar to find availability for online consultations. To make up for lack of time and budget we organized an internal survey with company employees. To reduce bias we didn’t include anyone involved with design, product, or strategy, and tried our best to emulate the diversity of users registered to our site. Our objective was to verify a patient’s journey towards a confirmed appointment with a medical specialist. Patient generally calls the practice office to request a visit unless they are registered with a health system which provides online scheduling. They don’t expect to be talking directly with the provider when requesting a visit. They may have questions regarding length of treatments or types of procedures. If no-one answers they expect to be called back after leaving a message. (Confirming previous studies) Patients who have the ability to choose a provider will choose by location, payment method, then availability. Sometime patients make a choice based on clinical approach. These behaviors change according to the severity of the patient’s condition. The price or length of consultation isn’t questioned. Providers will indicate the length of a visit if it’s particularly long or requires specific dispositions. Behavioral therapy first visit is generally an hour, although shorter visits may be offered. Medication refills or routine check ups are similar to low acuity care visits. 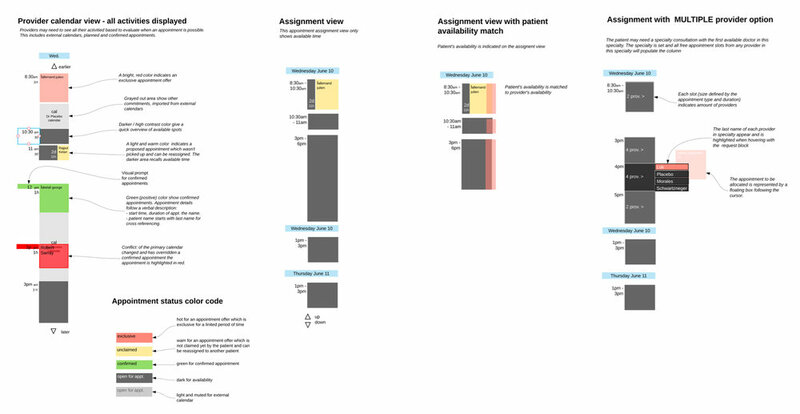 Patients seek the earliest appointment that match their availability. Patients often ask questions which are conditional to booking an appointment. If appointments are not directly available online patients are willing to call a practice to discuss appointments. It was now time to reflect on the research. This phase consisted of abstracting the research into “components”. Doing so helped us understand the dynamics at play and would later help with the ideation and the project prioritization. Who Will Use The Scheduling Tool? Talking to patients and providers we realized there were different types of scheduling interactions. We identified 5 kinds of scheduling methods. A patient is proposed a consultation with the first suitable provider available immediately (within a short period of time i.e. 5 to 20 mins). A patient chooses an appointment availability from a list of appointment slots generated from a dynamic calendar which accounts for all provider’s activities (online, in-person and personal calendars). A patient chooses an appointment from a list of available appointment slots. The practice has defined an online schedule for a provider and appointments are generated from the remaining availability on the schedule. A patient requests an appointment by message, the practice checks on the provider’s calendar and sends a number of appointment offers. A patient calls (by phone, video, or live chat) a practice during opening hours to find out about availability and negotiate an appointment time. Providers or staffer may maintain several schedules which may be associated or kept independent. An appointment decision will be taken based on a consolidated view of all the schedules. We anticipated a telehealth appointment to be duplicated (or exported) to an EMR schedule so the encounter is accounted for and included in the patient’s record. Syncing upstream towards a primary calendar would likely be challenging and would require deeper research. For providers who work exclusively for a clinic or hospital and whose schedule is decided and managed by a third party. For providers who work in several places and maintain several alternative schedules. Reflecting personal activities recorded on a personal schedule. Patient describes what they are seeking or the reason for requesting a consultation or ask questions about the visit. These two components can be conditional to requesting a visit. Most patients will directly ask for a visit they know they need—they often have a type of referral. We listed a number of specifications that could define an appointment. When interviewing patients we asked to describe a typical appointment request. We observed that multiple “rounds of negotiations” would occur until a match was found. Reflecting on the workflows followed by patients selecting a specialist consultation online it appeared to us that the consultation was preset by a staffer or a provider beforehand. The appointment selection was systematically the product of negotiation vetted by a provider who in fact was giving referral. So if a patient can choose from a number of appointments types it isn't guaranteed the appropriate appointment will be chosen. A scheduling mistake may create costly gaps in a provider schedule. Therefore providers must have simple ways to change the request or reschedule. For the system to assign an appointment choice in answer to request and if there are more than one length of appointment available we must provide a clear expectation regarding the appointments objective. Rules must be established to show only the relevant appointments. A patient who sees a provider for the first time should be able to request a medication refill without prior medical evaluation. Specialists generally use multiple scheduling systems. Our system is almost always secondary because most specialists don’t work exclusively on a telehealth platform —they are complementing their primary activity with us. Providers must have the ability to—at least—import calendars to the online visit scheduler. We will need technical expertise on calendar formats and exchange of calendar data. At this point in the research we can only make assumptions about the way calendars work based on our own experience of standard format. We know from providers that some EMRs can export calendars, we don’t know yet if they can be edited or if calendars can be imported to EMRs. We will have an issue if the activities performed on our online visit platform need to be accounted for on an EMR or whichever planning tool a practice or clinic uses. We must reduce manual input. And if manual input occurs it needs to be facilitated. Finally, a providers might not control their other schedules and providers may work with very little lead time to prevent conflict with the online visit schedule. We can expect conflicts to happen due to rapidly changing schedules and obligations stronger commitments with other organizations. Our scheduling system must have ways to highlight conflicts and address them. The system must be able to address most expected user behaviors and tolerate various level of engagements from providers. A behavioral therapist is generally very different from a speech therapist or a psychiatrist, they generally work in different environment and their attitude towards the telehealth medium varies. The patient isn’t logged in and could call the telehealth service’s customer service to request an appointment with any provider in a given specialty. The patient could be logged in, choose a provider and send a message requesting an appointment. The patient is logged in and could choose a provider and call the practice to request an appointment and discuss an appointment. Being flexible with providers allows for building networks faster than the competition. We are still in a phase of adoption and specialty medical and wellness services is an emerging market for telehealth. Prior to the ideation session we organized a meeting that consisted of a review of the research. The output of the meeting was a list of requirements and problems to solve. This list would continue to be edited as new discoveries surfaced during the design process. We listed a number of problems the design would need to solve. We will refer to this list until the end of the project, new discoveries will bring new requirements. A pending appointment proposal may block a provider’s calendar until the patient has approved has selected an appointment. Appointment proposals may “clog” the provider's schedule. Patients must be able to communicate concerns and questions before or while requesting an appointment. Patients should be able to speak or chat with staff at the practice. Patients should be able to ask for an appointment and suggest times. Patients who contact a provider/practice online should be able to communicate their recurring availability to the provider so the provider can make a better appointment offer and increase the odds of settling an appointment with a minimum of interaction. If a schedule is published and appointments slots are available, patients should understand which appointment slot to take. The actions a patient took during contact and appointment should be acknowledged and the patient should be provided expectations and guidances about the next steps. Patients must have the ability to change or cancel appointments (within business rules). The information required to organize an appointment should be centralized within the scheduling tool. Our research helped define the landscape we’re working with, and the UX team and other project members were now speaking the same language. It was now time to compare notes and formalize ideas. It’s important to recognize that ideas come during the exploration phase of a project. Each team member needs to have individual time to reflect. We may share reflections during the discovery phase but each participant in the research should keep their own sets of notes and ideas. To me, the ideation meeting is a moderated collaborative experience where each participant brings to the table well-constructed thoughts to present to the team. It’s a place for argumentation and challenges. Ideas are eventually accepted, refined, and bundled in concepts, recommendations, and features ideas. Ideas need time to mature, so, whenever possible, I like to organize several sessions so the participants can go away and refine their concepts by looking for additional validation or by looking for leaner ways to obtain a result. We would often work on a project in a team of two or three over relatively extended periods of time because we tended to work on numerous other projects at the same time. We had organized a “creative relay” where we would take over each other’s work to evolve it further. Preventing or reducing staffer’s or provider’s interactions with other schedules and calendars while scheduling an online appointment. Reducing the number of transactions necessary to confirm an appointment. Our current medical platform didn't allow for patients and providers to make contact prior the first appointment. But a workflow (dysfunctional) allowed for asynchronous negotiation. It’s standard behavior for patients to contact a practice in order to set an appointment. Until we have a live scheduling feature offered to patients it will be more efficient for patients to negotiate an appointment over the phone or by chat. Practices must have the option to be called or to call the patient back. We propose to develop a “call for appointment” option which allow patients to call the practice from the application during business hours. A gateway number may be used. Alternatively a “Call Back” option may be offered by practices. A large proportion of patients call customer service to ask for a doctor’s appointment. Customer service needs to be able to put the patient in the appropriate workflow so customer service isn't brokering the appointment. To support "Phone Only" appointments we find essential to provide a "Call Back" option so providers and practices can handle the appointment. Customer service would only help a patient choose the appropriate providers and formulate the request. To optimize their chance of settling an appointment during the first round of negotiation, reduce wait time and abandonment, we propose developing a feature - a widget - to declare upcoming availability. Availability would be rounded to morning, afternoon and evening. 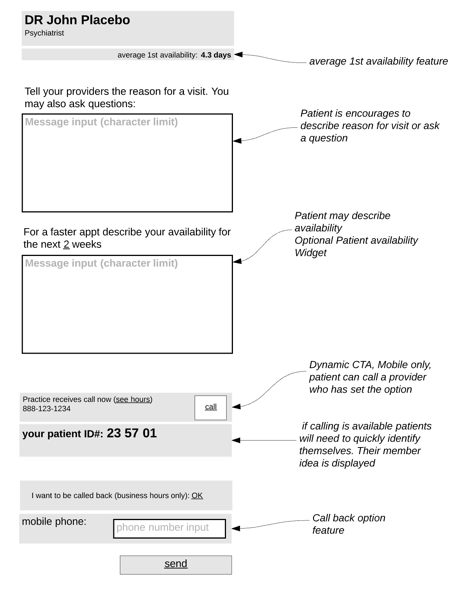 The widget could be used by patients, but also by practices who take calls. The feature would prevent the practice to take external notes. An the input would be matched with upcoming availability. Scheduling is generally delegated to staffers so it is essential to create user roles. Staffers must be able to manage multiple schedules to multiple providers. This will require the development of workflows for group management so a staffer can represent a group of providers and a provider can create a staffer. The staffer must have limited access to the service and should have access to PHI (personal health information). Our current calendar is like most calendars online: it provides a global view of all activities in a day, a week or a month. It was designed to plan availability on the fly by slots representing a duration matching the appointment duration specified as preferences by the provider. Our calendar is a “Classic” online calendar that is a sortable table designed to let users know the date and time of events than spans from now to infinity. The scheduling system should focus on the time that’s immediately relevant to the user and hide the information that’s not relevant to the intended purpose. In a classic calendar, availability is defined by empty spaces. 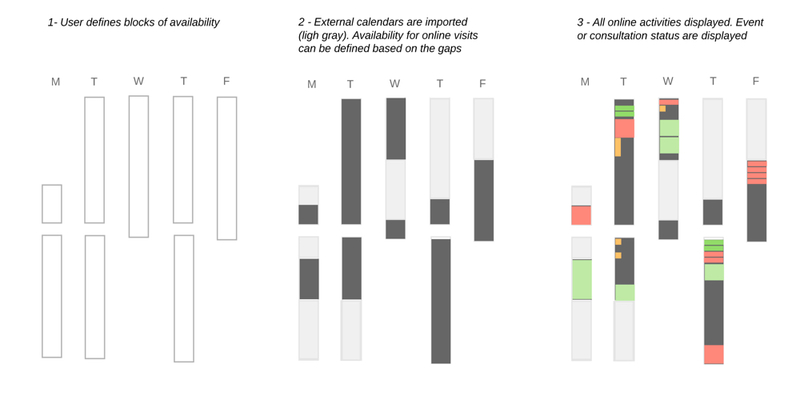 But for scheduling, empty spaces—or available spaces—should be the visually highlighted areas of focus. While importing an external calendar the user could let the system feel the gaps with availability, then the user would edit availability. Calendar syncing is an essential aspect of this project. The ease of use of the scheduler relies the importation of external calendar. The system must be able to deduct the empty spaces between calendar entries and make them blocks of available appointment slots. 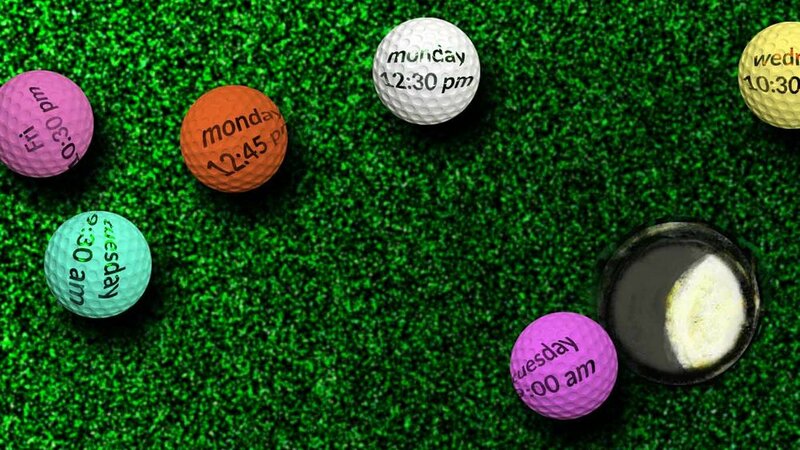 The blocks are editable and can define actual available appointment time. The blocks could eventually be exported and included in other calendars used for evaluating planning work activities. If the calendar can’t be imported to another system, assuming these systems can export calendars the user can then consolidated all calendars on a third party application (provider we talked to use their phone to consolidate their different schedules). Classic calendars can toggle calendars and search entries. Our scheduling calendar must be able to display selected types of entries as well as toggling and muting imported calendars. Different contexts will require different focus. This feature would allow to define modes: at least a scheduling mode which would simplify the interface and let the user focus on availability only. Negotiating appointment often occurs in a short time range. The first appointment availability is most of the time followed by others in the next day. A patient should define a provider and period of time suitable for appointment. The system should choose the most suitable times based on the first available appointment slot. The interface must accommodate this by providing some fluidity and a Drag, Hover and Drop type of interactions when attributing appointment slots to clients. The system must be designed to accommodate many users looking at the same schedule almost at the same time. The system must address all the users - including practices organizing appointment - have a choice between appointment options without limiting an other user choice. User should be given a limited number of options they can refresh. The options should also be refreshed by the system on time-out. Also the number of appointment slots proposed may vary based on the demand predictions at any given time. We want to optimize options but minimize wait time before the first appointment offer. An appointment slot has value. The earliest spot isn’t always the most desirable. An appointment slot at peak consultation hours (generally around work hours) is more valuable than an appointment mid morning on a weekday. The gaps between two appointments on a provider schedule also has value - we want to minimize these gaps so providers have a better incentive working with this system than others. 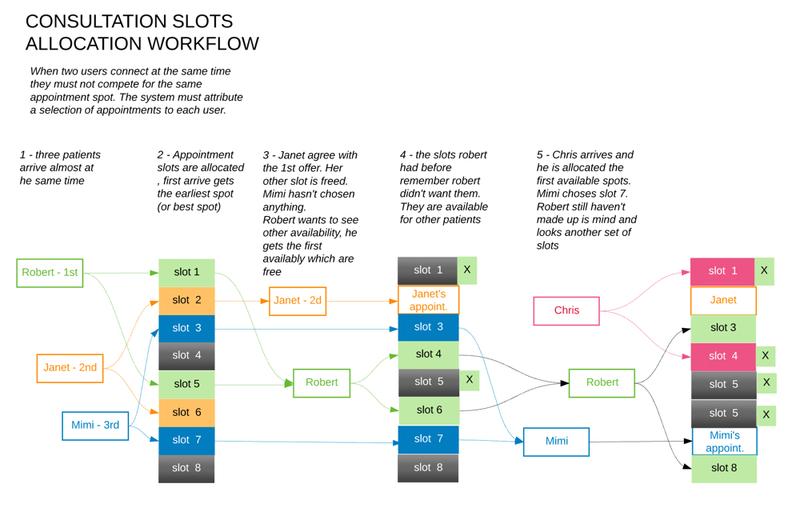 The allocation algorithm needs to learn to identify the value of the available appointment slots and sort them properly. The appointment proposed by a practice or a provider should be “exclusive” to a patient for a limited period of time to prevent conflicts with other appointments. The appointment shelf life should be defined by user preference. Modifying an exclusive appointment should require a justification sent to the client. Past the exclusivity period the appointment slot could be reclaimed for another appointment. The appointment proposal should expire within a given period defined either by a time following the appointment creation or a time preceding the time appointment. This should also be a user preference which should be editable case by case. There would be few differences between this online consultation scheduling system and a system that supports in person appointment. Location would be a new parameter to manage, for providers - working in multiple location - and for patients who are generally looking for the convenience of short commute. The system should support search by specialty and support the choice among many providers for the same appointment slot. On the practice side this could allow a fair distribution of the work, on the patient side more choice criteria available (ex: a user would only want a female provider, multiple provider options would increase the odds of an earlier appointment. The early designs account for multiple development options and phases as well as the scheduling practices of different types of providers. Our ultimate goal is to reproduce a live scheduling interaction and reduce the number if transactions necessary to find a match. 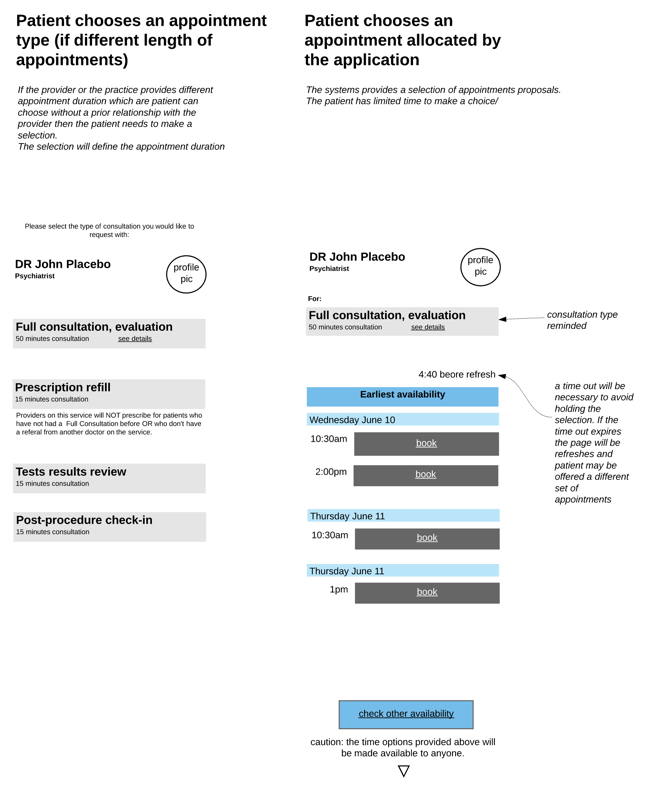 2: (PATIENT VIEW) shows an automatized transaction where the patient selects a type of consultation (left) then the system makes appointment slots proposals (right). mockup 1: (PROVIDER VIEW) this view allows a provider or a clinic's assistant to cycle through patients' requests and check their validity. The appointment setup process starts here. mockup 2: (PROVIDER VIEW) the user now checks a near future calendar on a monthly view and sees matchs highlighted. Selecting a match would automatically set the appointment. Mockup 3: the user can also allocate manually an appointment based on an agenda view which focuses solely on the remaining available slots that fit the consultation length. A provider is free to shift around appointment which have been proposed to others but not taken - the number of days since the initial appointment proposal are indicated with a symbol (dots).